Since 1997 Gill and Andrew Preston have been providing comfortable and affordable accommodation throughout the year. This bed and breakfast is ideally situated nearby the town centre. Full english breakfast provided. Short breaks are welcomed, making this residence popular with divers, ramblers and cyclists. A warm welcome awaits you in this friendly and affordable guesthouse. Only a few minutes walk from Swanage town centre, beaches and coastal path. Hermitage Guesthouse sits on the west side over looking the bay and Old Harry Rocks. Parking on site available. Full english or vegetarian breakfast served. Situated just half a mile from Swanage town centre and the South West Coast Path (SWCP), Harmony House provides en-suite bed and breakfast accommodation. Family, double and twin rooms available. Full cooked breakfast and other options available. Walkers welcome. Swanage Coastal Park welcomes tents and limited space for touring caravans with hook up. Tents are available for hire also. Swanage Coast Park is ideal for Weekend breaks or main Family holidays, Walking holidays, Mountain-biking holidays, Diving Holidays. The park is open throughout the year, making it an ideal location for both families and couples. Tents and tourers welcome. Surrounded by outstandingly beautiful countryside and a breathtaking coastline of dramatic cliffs. Excellent facilities including swimming pool. Very popular site, early booking needed. Shell Bay Cottage is surrounded by National Trust land and commands stunning views over Poole harbour. Only 5 minutes walk from the beach and local amenities in the village where evening meals are served. Pick up/drop off by arrangement, but walkers can walk easily to the jurassic coast within minutes. Close to the famous Poole beaches, and whether you are on holiday or there for business, Laurel Cottage Bed and Breakfast has something for everyone. All rooms either en-suite or with private bathroom and a full cooked english breakfast is served. A pet friendly B&B. Local pubs for evening meals. 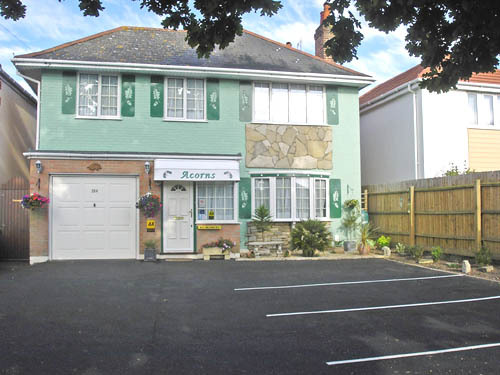 A Traditional family run bed and breakfast in a popular area of Poole. Double, Twin, and single en-suite rooms are available all with wi-fi connectivity. Complimentary tea and coffee making facilities in every room. Full english cooked breakfast or continental served. Walkers and cyclists welcome. Acorns Guest House offers relaxed and friendly quality accommodation. All rooms are en suite, have hospitality tray, hairdryer,TV, WI-FI and alarm clock. Continental, full english or vegetarian breakfast is offered with dietary requirements catered for if known in advance. A packed lunch can also be provided on request and at a small charge. Ideal for walkers on the South West Coast Path. Now with new proprietors, Fleetwater Guest house is undergoing refurbishment. Therefore at the moment it is being offered on a room only basis until April,which significantly lowers the price.... however they have an arrangement for breakfast with a local pub a few doors away for a discounted, hearty breakfast. Two rooms available this year,both en suite, a twin and a family, although it may be possible to take a single walker but with a supplement chargeable.